Choosing a sea kayak Classic sea kayak Intended use Five styles of classic sea kayak: — Greenland kayak— modified Greenland— round-bilge dayboat— expedition kayak— ocean race kayak Will this kayak be stable enough for me? Sea kayak features:— rocker— volume— volume distribution — cockpit size & shape— seat— knee braces— deck shape Want to get more technical? You can take any sort of kayak on the sea, but a classic sea kayak will look after you best. Pretty much any sea kayak will be fine for pretty much anybody. Read the rest of this page... in fact the rest of this chapter.... only if you want to know all the options. The classic shape is the traditional Greenland hunting kayak with its long overhangs at bow and stern. The design was first tested 3500 years ago in the Arctic and has been polished by millennia of ice and blood. See Some Greenland History. It is excellent for the sea, estuaries, lakes and for any rivers that don't have rapids. Lovers of slim traditional kayaks with a width of 22 inches or less say you don't sit in your kayak, you wear it. It's a good feeling which any ordinary kayaker can enjoy. You could argue for hours over the definition of a classic sea kayak. We would say that it must be capable of covering long distances, must behave well in wind and waves, must protect you from cold and spray, and recover fast and easily from a capsize. Given the right training and equipment, that makes it safe for use all year on exposed coastlines. The classic sea kayak has a long, narrow hull, fully covered by a deck. That doesn't necessarily mean that the kayaker sits inside a cockpit which is sealed with a spraydeck. That is certainly your editor's choice, because it keeps him warm and fairly dry so he can go out all year round. However sit-on-top kayaks are very, very popular in warm climates and with owners who intend to go out mainly in nice summer weather. For a man 5 ft 10 in tall, a length of 15 ft 9 in to 18 ft and a width of 18 in to 23.5 in, which is getting a bit bulky to roll easily. For a woman 5 ft 4 in tall, a length of 14 ft 10 in to 17 ft 3 in and a width of 18 in to 23 in. But as we say, you can take any sort of kayak on the sea. We've had some great times in very ordinary general purpose kayaks. Elsewhere we consider double sea kayaks, skis, sit-on-tops and others. See Sea Kayaks vs. Other Kayaks & Canoes. The sea kayak existed in the Arctic in very nearly its modern form before contact with Europeans, perhaps for as much as 3500 years. Later milestones in kayak design and technology were John "Rob Roy" MacGregor's invention of the wooden touring kayak in the 1860s (click here to go to a free online copy of his book A Thousand Miles in the Rob Roy Canoe); the widespread use from the 1920s of kayaks with a canvas skin stretched over a wooden frame, including folding kayaks with rubberized canvas skins; from the 1950s of plywood for kayak hulls, with inflatable or closed-cell foam flotation; fiberglass for hulls from the late 1950s, becoming widespread in the early 1960s and with the option of Kevlar since about 1973; from the 1970s of bulkheads or cockpit pods to make watertight compartments, and effective hatch covers, retractable skegs and sea-proof rudders; from the 1980s, polyethylene for kayak hulls and wetsuit material for sprayskirts making it possible to have bigger cockpits; and the introduction of various other plastics from the 1990s. Much more important than the technology has been the parallel increase in kayaking skills. It's the ability to avoid capsize, to roll and to carry out a tow or deep-water rescue that make a sea kayak a truly seaworthy craft. All of today's touring sea kayak designs would look very familiar to a kayaker from the 1970s, apart from a tendency for some kayaks to get fatter which is a bit of a mixed blessing. The major developments of the last ten years have been driven by economics rather than the demands of the sea. There are now some short, fat "sea kayaks" 13 ft 9 in long and 25 in wide, with deck rigging, bulkheads and thigh braces. They look cute and they are light to carry, but they are slow, behave badly in rough water or windy conditions and are almost too fat to roll. The new "recreational kayaks" are very short, very slow, and usually lack basic safety features such as flotation and thigh braces so they can't be rolled. When paddled around without a sprayskirt or basic knowledge they're a limited sort of fun, and not really safe even in a harbor. Do you want the regular rigid (hardshell) kayak or do you need something you can store in a closet and take on an airplane? Folding kayaks are tough and some are very attractive, but portability comes at a price, usually both financial and in terms of reduced performance. See Folding & Inflatable Kayaks. If you chose rigid construction, do you want a plastic kayak or a composite one? For economy and crash resistance there's polyethylene. Then there is an intermediate range of plastic sandwich materials including Royalex, Duralex, Airalite & Carbonlite. For the best performance and long life but at nearly twice the price of polyethylene, there is composite construction which includes fiberglass, kevlar & similar reinforced plastics. Do you want a kayak just for daytrips, or an expedition kayak? Or maybe a fast touring kayak? See Intended Use, below. Are you attracted by any particular style? Will that kayak be right for somebody of your height, weight and center of gravity? See Man, Woman or Child. Will that kayak be stable enough for you? What features and accessories should I look for? See Sea Kayak Features and Kayak Outfitting. For retailers, manufacturers and importers, see Retail Outlets. A traditional-style sea kayak for a man 5 ft 10 in tall is usually 15 ft 9 in to 18 ft long and 18 to 23 in wide. It will weigh between 45 and 60 lbs if made with conventional materials. Any more and it will be too heavy to carry solo, any less and it is unlikely to be tough enough to hit rocks and keep going. Most sea kayaks are unisex, which means they have enough volume to float the average man. A smaller person can have a smaller, lighter kayak with less underwater surface area. Less underwater surface means less to drag through the water with muscle power. Smaller does not necessarily mean much shorter. Above a certain speed, a short kayak becomes inefficient. Women are usually not only smaller than men but less top-heavy, which means they often feel happy in a slim, fast kayak which a man would find unstable. The big manufacturers generally make at least one kayak intended for users weighing 110-130 lbs. A woman 5 ft 4 in tall may find that 14 ft 10 in low-volume kayak, 20 in wide, makes a good lightweight dayboat, and that a 17 ft by 21 in kayak makes a good expedition boat. We think the crucial factor is not overall width but width at the waterline. See Sea Kayaks To Fit Women. A few manufacturers produce sea kayaks for children. A commercially-made sea kayak is expensive if the user is likely to grow out of it in a year or so, which makes building a skin-on-frame or plywood kayak at home an attractive option. See Child-Size Kayaks. Most kayaking is about experiencing the environment rather than covering long distances with a heavy load. Dayboats can be shorter, slimmer and lighter than expedition boats. If you want to explore sea caves and play in water pouring over reefs and rushing past seaweed-covered boulders (rock-hopping) then your kayak should also have more rocker for maneuverability. You might choose the red Greenland kayak, below. If you want to cover long distances, you probably want a long sea kayak with a keel line which is almost straight. To carry a heavy or bulky load of food and camping equipment you need a kayak with medium or high volume. To get higher volume, the designer has to increase one or all of the kayak's length, width and depth. That means increasing its weight and drag. See Expedition Kayak. "Performance touring" kayaks are descended from the Greenland kayak but via flat-water racing boats. They are as long as an expedition kayak but narrower and usually of lighter construction. To achieve maximum waterline length, which means better streamlining and a higher potential maximum speed, these kayaks have little overhang at the ends. The ends are nearly vertical. If you want to cover a lot of distance in one day, or be able to surf even the shallowest offshore swell, these are the kayaks for you. We list a few manufacturers. They remain a minority choice because of their low stability, and because they tend to be built for light weight and speed rather than strength. They're not suitable for rock-hopping because they always want to go in a straight line. They do not feel particularly unstable while you are going along, except in a rough sea, but when you stop you may feel the need to use your paddle constantly, doing a sculling brace in order to stay upright. We have left some boats out of this section. We leave out fast skis because they are delicate and unstable, ordinary polyethylene sit-on-tops because they are slow and heavy, and both because they don't provide the protection from waves and spray that is essential in a cool climate. See Ocean Racing Skis and Sit-on-Top Kayaks. We have also left out kayaks which are too wide to roll, although some of them have achieved great things on the sea. See Folding Kayaks. One big style difference is in the cross-section. Traditional kayaks have an angular shape (hard chine or double chine). Most recent designs have a round shape (round bilge). The classic Inuit hunting kayak from Greenland is slim, narrow and curved, with a very angular cross-section. Seldom has much space for camping equipment. This one is 21 in wide, 17 ft long and has quite low volume which makes it easy to roll. The long overhangs, especially at the front, mean that its waterline length is considerably shorter. It also has high rocker. Both characteristics give it more maneuverability but less speed in a straight line. The hull shape of most Greenland kayaks consists of four flat panels, each going from one end to the other. The bottom of the hull is a flat V-shape, the sides are almost vertical, and where the bottom meets the sides there is a sharp angle (the chine) which runs all the way from bow to stern. The rear deck is another flat panel, horizontal this time, and the front deck is usually raised in a long ridge to make room for the kayaker's knees and feet. A sea kayak, like most boats and ships, has a displacement hull. It is designed to move through the water rather than skimming over it like the planing hull of a powerboat. Except in one-design classes, serious race boats never have hard chines because they give the hull more underwater surface area than necessary and in calm water they create eddy currents along the chines. Both mean more drag for the kayaker to overcome. It is also true that if you hit a rock in a hard chine boat, the sharp angle is vulnerable to damage. However Greenlanders still prefer hard chine, and many kayakers and designers say that it is the best shape for a sea kayak, that it is "sea kindly". In other words, that it produces a hull which feels good in rough water. The hard chine shape can certainly give high secondary stability which enables a kayaker to stay in balance when leaning a very narrow kayak over to the side. Because sea kayaks are hard to turn when upright, kayakers often do lean them over while turning left or right. A West Greenland-type hunting kayak may have extremely low volume, being as little as 18 inches wide and 9 inches deep. Such kayaks are hard to get into, not very stable, give a wet ride and are particularly prone to forward loop in steep waves when the front of the boat goes deep underwater, but they are good looking, fast and very easy to roll. See High Or Low Volume. Many of the Greenland designs now made in Britain are descended from a single example made by Emanuele Korneliussen in the West Greenland village of Igdlorssuit (now Illorsuit) in 1959 for a university student called Ken Taylor. The original is in the Kelvingrove Museum in Glasgow. Another British kayaker wanted a slightly wider and deeper version because he was taller and heavier than the average Greenlander. He made one in plywood. The hard chine shape still made sense because plywood comes in flat panels. It looked so good and performed so well that a fiberglass version was put into commercial production as the Anas Acuta (Latin name of the pintail duck). The Anas is still in production and is on sale in Britain and the USA. It has inspired many other designs. Like most kayaks which are close to the Greenland model it is a dayboat, not intended to carry a heavy load, and has quite a lot of rocker which makes it more maneuverable. It likes rough water. Because of the flat-V hull shape it feels a little unstable at first. For some websites about Greenland kayaking, click here. A plastic kayak can be almost any shape. Some designers have slightly modified the Greenland kayak to keep its low volume and good looks but give it rounder chines ("soft chine"). 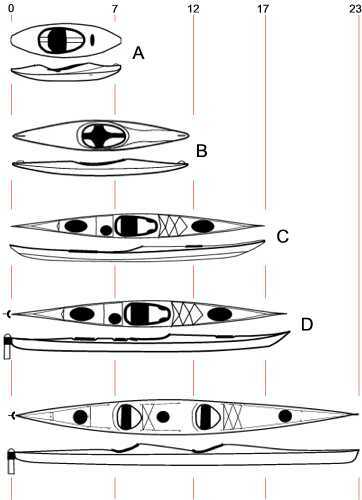 For the cross-section of a modified Greenland kayak of moderately high volume, see the first illustration at Kayak Stability. The typical plastic or composite sea kayak. The chines are now so round that in cross-section, the hull has a smoothly rounded shape ("round bilge"). A semi-circular underwater cross-section would be too unstable, so the bottom of the kayak is almost flat for 3 ft or so in front and behind the seat. At first glance there may be little difference between a round-bilge boat and a Greenland kayak. They may both be the same length, width and depth, and they may have the same plan view and a similar profile. The big difference is in the shape of the cross-section. The blue one is manufactured in glass-reinforced plastic. It is the same length and width as the red boat. It has less rocker and more waterline length so it is less maneuverable but faster in a straight line. Like the red boat it has fairly low volume, but the rear deck has been raised an inch to give more storage space. It is a fast dayboat which looks very nice on the water and could be used for the occasional camping weekend. Round-bilge kayaks very often have shorter overhangs than Greenland kayaks and they are usually a little wider and deeper. That means more volume which enables them to carry a heavier load. The yellow kayak is mass-produced in polyethylene. It looks quite attractive on the water but to reduce its weight the designer has made it shorter and to make it reassuring to beginners (s)he has made it wider. It is significantly slower than the red or blue boats. It has no rocker at all for most of its length and it does not much like rough water or surf. An expedition boat looks exactly the same as a dayboat until you compare them side by side. The expedition boat has a longer and deeper hull, which means extra volume so it will carry a heavier load. With careful packing, you can carry enough camping equipment and food for two weeks. An expedition boat usually has very little rocker. There are disadvantages to an expedition kayak. Being bigger and heavier than a dayboat it is harder to get on and off a vehicle without help, it may be too long to fit in your garage, and even if it is no wider than a dayboat, a longer kayak has more wetted surface which means more drag. Many expedition kayaks are designed to perform best when carrying a heavy load. They achieve this by being unusually narrow at the waterline, which means that when unladen they are unstable and can become a problem in windy conditions. Some owners of true expedition kayaks have to put bags containing 50 lbs of ballast in each end before they set off, using bags of sand or stones. That can be a real surprise for any kind friend who offers to help carry the boat up the beach at lunch time. Within each of the above categories you will find some kayaks which are designed to go fast, at the expense of maneuverability and stability. A few sea kayaks take this to such an extreme that they make up a design style of their own. We list a few manufacturers. See also Ocean Racing Skis. Sea kayaks and skis designed and built specifically for racing are very slim, light and rigid. For a high maximum speed, they have very little rocker and a long waterline achieved by having little or no overhang. In other words, the bow and stern are almost vertical. Speed is attractive, and these are very attractive boats, but that does not mean they are suitable for general leisure use. A racing kayak is pleasure to carry to the water, but may be hard to handle in rough water, and when you stop it may capsize in the blink of an eye unless you make constant use of your paddle to stay upright. See Sculling Brace. Race kayaks are built to win, not to have a long life span. During the Liffey Descent or the old Exe Descent, which are river marathons with big weirs, you could see plenty of flat-water race boats snap into two or three pieces. A kayak may encounter the same forces at sea, although probably not during an organized race. See A Kayak Must Be Light and But Not Too Light. Will this kayak be stable enough for me? If your kayak is too stable it will be slow, and it will be uncomfortable in rough water. A suitable sea kayak probably will feel a little tender at first, even if you are an experienced user of river kayaks. Most sea kayakers like to stop paddling from time to time, have a rest, look around, eat something or take a photo, and they prefer a kayak which is just stable enough to do this at sea in calm conditions. If conditions are not calm, they are happy to raft up next to a friend for a few minutes, or use the paddle to scull lightly for support while resting. Most popular sea kayaks are stable enough for most people. As a guideline for dayboats, any hard-chine Greenland kayak with a total width of 20.5 inches or more, and any round-bilge kayak with a width of 21 inches or more, is likely to be stable enough for a newcomer to sea kayaking. Total width is the easiest indicator, and the only one stated in many manufacturer's catalogs, but the kayak's width at the waterline, the shape of its cross-section, the height of the seat and the kayaker's own height and build are equally important. See Kayak Stability. Manufacturers usually give a helpful description of the qualities of any particular kayak, but the only way to find out if it suits you is to paddle one at sea. If your new sea kayak seems very unstable to start with, don't worry. You will soon get used to it. Try this exercise in very shallow water. Sit in your kayak, stationary, holding your paddle. Lean your kayak and your body over to one side. You may be surprised how far you can lean without needing to use your paddle to support yourself. If the seat is removable, you can temporarily reduce the center of gravity by taking it out and just sitting on the bottom, on a piece of thin foam, until you feel confident. If you look at a kayak from the side you will see that the the bottom ("keel line") has some curve so that the underside is higher at the ends. Put the kayak on a flat surface, press down on one end and it will rock. It's like the bottom of a rocking chair. The red boat has high rocker. The blue boat and the gray one below have medium rocker. The expedition kayak has low rocker, the race kayak has very little, and the yellow boat has more or less zero rocker. Practically everything for use on the sea has rocker - surfboards, sailboards, yacht tenders, rowing boats, racing dinghies, multihulls, keelboats, powerboats, ferries, even small cargo ships. Rocker helps them turn right and left, it helps the bow rise to a wave, and it helps streamline the boat so it parts the water efficiently. You could say it helps a boat fit the shape of the sea. A sea kayak should always have some rocker. If it has very low rocker it will want to go in a straight line, and only in a straight line, and it may feel unstable except on flat water. High rocker makes a boat more maneuverable and better in steep waves, but slower. High rocker can also make a boat feel a lot more stable. The height of the paddler's centre of gravity, and therefore the height of the kayak seat, is a crucial factor in stability. An inch up or down can make a lot of difference. If a kayak has high rocker, the middle of it makes a deeper hole in the water. This could well reduce the height of seat by an inch. The red boat with high rocker is intended for day trips by sea kayakers who like playing in the surf and amongst caves and rocks. The blue boat is intended to do longer distances. These expressions are relative. When we say "kayak A is really high volume" we really mean "it's fat and bulky" rather than "it has more litres than kayak X". Any long kayak is likely to have more volume than any short one. The yellow boat above is "high volume" because it has a lot of liters for its length and it looks borderline obese. It actually has fewer liters than either the expedition kayak, which probably most kayakers would think of as medium volume, or the ocean race kayak which many would describe as low volume. A kayak which is "low volume" for a man may be high volume for a woman and enormous for a child. Most sea kayaks are unisex and have 300-400 liters, which is enough volume to support the weight of a man. The red kayak has 300 liters. It makes a nice slim day-boat for a 200 lb man who seldom carries more than a repair kit and lunch. 300 liters would also suit a 110 lb woman who intends to do a lot of expeditions with a 90 lb load of equipment and supplies. See comparison photo. Beginners often prefer the reassuring feel of wider, higher boats like the yellow one. An experienced kayaker sees at once that they are slow, have a harsh motion in choppy water and are hard to paddle in windy conditions. Wind is the kayaker's big enemy. See Beaufort Scale For Kayakers and Leeway. Greenland kayaks like the red one usually have fairly low volume. Their owners love the feeling that they wear their slim boats rather than sitting in them. Low volume can be good, but very low volume is not necessarily better, especially if you may find yourself in surf or trying to rescue somebody. This kayak has extremely low volume for its length. At 210 liters it is barely more than a large windsurfer. Paint it white and it might suit a Greenland seal hunter because seals can't easily see it coming. It might suit an experienced recreational kayaker who will find it fast and very easy to roll. Because it does not have much above the water, it is less affected by wind. On the water it looks sleek, hungry, lean and mean. There is enough room inside for your sandwiches and repair kit, but not enough to go camping. • It floats very low in the water so you have a wet ride. Even small waves wash across the deck. • If there is a leak in your kayak or sprayskirt you will have little warning before you sink to the point of being unable to continue. • Deep-water rescue requires a special technique. See Skin-On-Frame Kayaks & Offshore Safety. • In terms of its ability to resist snapping in half, for example when looping in surf, a kayak with very low volume is weaker than a conventional kayak because its cross-sectional shape is so shallow. • A kayak with very low volume can be.... exciting, that's the word, if you have to land on a beach in big surf because you may find yourself cartwheeling towards the beach end over end... over end... over end. One cubic foot of sea water weighs 64 lbs. The metric system really scores with buoyancy calculations, which is why hull volume is usually measured in liters. One liter of water weighs about one kilogram. Sea water is fractionally denser at 1.027 kg. A watertight box containing 1 liter of air will float a load of 1 kg on water. A kayak must not only support its own weight (55 lbs), the weight of the kayaker (120-190 lbs) and the occasional load. It should also have enough volume to keep its deck above water most of the time and in most conditions. Quite small changes to a kayak's length, width, depth and cross-sectional shape can make a big difference to its volume, so it is not easy to estimate by eye. Most manufacturers state the volume of each kayak in their catalog. Look at a kayak design from above, the plan view. Most sea kayaks are fattest in the middle. They taper gently towards the ends until there is almost no volume in the front and rear 8 inches. A few have the fattest point slightly behind the cockpit (Swedish form) and a few have it slightly in front (fish form). Serious racers prefer Swedish form because it permits a slightly more efficient paddle stroke. For the rest of us, it is no big deal either way. Start to worry if the designer moves the cockpit backwards away from the center, or makes the ends unusually skinny. There is one current "home build" design which has its cockpit set noticeably behind the center. The idea was tried in the 1970s but it looked slightly odd and was a problem in cross-winds. The volume and stability of the center of a kayak should be carried a good distance towards the ends. A kayak with very hollow, concave shapes towards the bow and stern will be less stable and also prone to misbehave in steep waves. Skinny ends are not good unless you really like cartwheeling end-over-end towards the beach when landing through surf. The front 6 feet of a kayak should have a substantial amount of volume. This is to reduce a sea kayak's natural tendency to go deep underwater when going down a steep wave front. Known as pearl diving, pearling or purling, this is bad in itself because it slams on the brakes and makes the kayak unstable. It often leads to a forward loop ("pitchpole"). A West Greenland hunting kayak has a small round cockpit. It is hard to wriggle in and out of, but easy to waterproof with a small sprayskirt. Many old-school kayakers prefer this. It goes nicely with a Greenland paddle and a tuiliq. It is often called a Greenland-style cockpit or Ocean cockpit. Typically it is 16-20 inches wide by 22-26 inches long. To get in, you have to sit on the back deck and slide your legs in. Only then can you sit down in the seat. An Ocean cockpit is no problem unless the back of it is an inch or so too high, which makes it very difficult to get out alongside a high dock or a slippery boulder. Most whitewater kayaks and sea kayaks now have a much larger egg-shaped cockpit, often the same width as an Ocean cockpit but long enough for the kayaker to bring his/her knees up above the deck, at least one at a time, when (s)he is sitting in the seat. These cockpits have a knee grip on each side which projects a short distance into the narrow end of the egg, supporting the sprayskirt and allowing the kayaker to brace him / herself solidly in the boat. Called keyhole cockpits, they are typically 32 inches long and they're possible only because a top-quality modern sprayskirt made of wetsuit material can be that big and still stay solidly in place and waterproof in big surf. Keyhole cockpits are very reassuring to anxious new kayakers and great on long trips if you start to get sore legs or buttocks, because you can change the position of your legs from time to time. They make solo self-rescue a more practical possibility. See Self-Rescue For Solo Sea Kayakers. And they are wonderful on a choppy day when you are trying to get into your boat from a seaweed-covered rock. To roll your kayak, it is good if the back of the cockpit is of a height and shape which allows you to lean backwards until the back of your head is more or less touching the rear deck. The seat is for comfort during long trips, but it must also stop the kayaker sliding around. Even the most basic kayaking requires a seat which stops you sliding from side to side. Combined with a good footrest / foot brace and back support, a good seat will stop you sliding forwards or backwards even if you surf into a cliff. Combined with good knee braces, your seat will give you the connection to your kayak that is essential for more advanced kayaking, and it will keep you secure when you're upside down. A composite kayak often has a "bucket seat" moulded in one piece with the cockpit coaming which is then bonded to the deck with adhesive or filler. This means that the seat hangs from the deck and need not touch the hull at all. This is good when you grind over a rock because the hull is able to flex and is less likely to be damaged. Polyethylene kayaks usually have a separate seat which rests on the bottom of the kayak. The seat is made either of rotomolded polyethylene or PE (polyethylene) foam. It will have vertical sides to stop you sliding sideways during a kayak roll, but the fact that it touches the bottom of the kayak is less satisfactory. If you often seal launch off a beach, or if you often hit rocks, the bottom of the kayak is likely to get frayed where the seat touches the hull, and bent inwards where it doesn't. After 60 years of continuous development, most kayak seats are now pretty comfortable for most people. If you don't get on with yours, you can customise it by sticking on a layer or two of thin self-adhesive PE foam, or you can replace it. Replace your seat: If you want a separate seat of PE foam which sits on the bottom, you can buy a commercially-made seat like this one from any kayak retailer, or you can make your own. Users of traditional wood or canvas kayaks often don't have any kind of commercial seat. They just roll up a piece of PE foam camping mattress, put it on the floor of the kayak and sit on that, but it's not a very pretty solution. Click the image on the right to see how to make a nice-looking kayak seat from PE foam. Customise your seat: Commercial seats tend to be made for the largest paddler the manufacturer thinks is likely to use the kayak, so most people will want to add some thin foam padding. White-water and surf kayakers very often pad the vertical sides of their seats to make them a tight fit, which gives them a better connection to the kayak. A sea kayaker also benefits from having a close-fitting seat. If your seat is too flat, you'll probably find that your legs get numb and tingly after an hour or so. 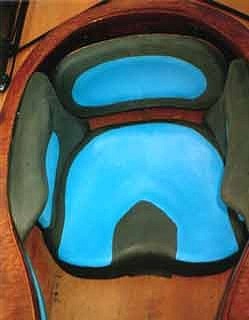 You can adjust it by gluing and duct-taping thin layers of closed-cell PE foam onto the front of the seat, under your thighs. You can buy PE foam in sheets 1/4" thick with a waterproof self-adhesive backing from a good kayak store. See Retail Outlets. It is easy to cut to shape with scissors or a bread knife. If your foam is not self-adhesive, you can stick it on with contact adhesive such as Evostik, or preferably with a polyurethane marine sealant such as Sikaflex. Give the relevant part of the hull a good scrub with a stiff brush and lots of fresh water first, to get the salt off. For more on PE foam, see Additional Flotation For Your Kayak. The height that the seat is installed above the bottom of the kayak is important. Racers like a high seat because it gives them a fraction more power, but it's less stable. If you've ever tried paddling your kayak with your legs in the cockpit but your bottom on the rear deck, you'll know that you're much less stable with your weight 3 or 4 inches higher than usual. If you take an inexperienced guest out kayaking you can make their life easier if you have a kayak with a removable seat. Take it out, and give them a bit of camping mat to sit on. With their weight an inch lower they'll feel much more confident (until their legs go numb!). It's good to have something on the underside of the deck, at the front of the cockpit, for your knees to grip when you roll or do deep support strokes. By pressing your feet against the footrest you can brace your knees firmly under the deck. Otherwise when you roll your body may twist around so far that your sprayskirt pops off, or you may simply fall out of the kayak. Ideally, if a couple of mountain gorillas picked up your kayak, turned it upside down and tried to shake you out, they wouldn't manage it. Commercial kayaks have a knee brace molded into the cockpit assembly. Traditional skin-on-frame kayaks have an arched wooden beam across the front of the cockpit called the masik, and this makes an excellent knee brace. If you are not happy with the knee brace in your kayak, you can easily improve it. If you have a polyethylene kayak it probably has some sort of knee brace. As with kayak seats, above, you can make it fit you better by gluing in a few layers of thin polyethylene foam. If you have a fiberglass or wood kayak with no knee brace at all, you can install two pieces of wood under the front of the cockpit. If you have a small cockpit, they need be no longer than 12 inches. Fix them under the front of the cockpit in a horizontal arrowhead shape, with the point under the front of the cockpit and the back of the arrowhead under the side decks, above the thighs. See How To Add Accessories To A Kayak. Alternatively either a knee box / knee tube or the foam pillar we recommend elsewhere will make a very positive knee brace. Most sea kayaks have a high front deck to give enough room for the kayaker's knees and feet, and a low, almost flat rear deck. In cross-section, the front deck is usually a pointed arch. It gives the front end of the boat a shape and volume which helps it rise up when it enters a wave. Structurally, a pointed arch is well able to support weight and this helps the front deck resist the crushing weight of some deep-water rescue techniques. See TX-Rescue. The low rear deck enables the kayaker to lie right back during a kayak roll, and provides a convenient flat surface on which to store a spare paddle. You'd maybe expect a kayak with a high front deck and low rear deck to turn downwind anytime the wind blows from the side. In fact, the underwater shape is equally important and most sea kayaks have a slight tendency to turn upwind, like a weathercock, when a strong wind blows from the side. This tendency is acceptable as long as it is slight, but many kayaks are fitted with an adjustable skeg or rudder to counteract it. See Skeg Or Rudder. The other good thing about a low rear deck is that a casualty can climb onto it for a Kayaker-to-Swimmer Rescue. 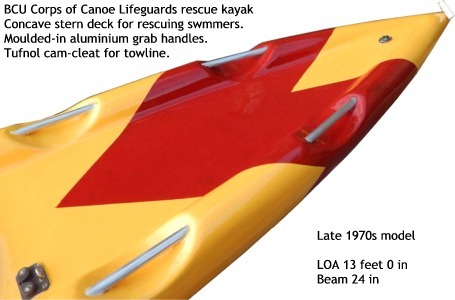 The lifeguard rescue kayak is based on this. Lifeguard kayaks are designed for beach patrols, escorting marathon swimming events, and so on. Lifeguard kayaks exist in several models. Some are fast sit-on-tops (rescue skis, similar to ocean racing skis); some are sit-in kayaks developed from classic sea kayaks or, like this one, from a general purpose kayak. They often have to carry swimmers, so they have a slightly concave rear deck with a raised edge running around it like a wall an inch and a half high. There are gaps at intervals in the raised edge so that water can flood sideways off the deck. Bridging each of the gaps there is a strong aluminium rod. That way, the rear deck is like a stretcher with handles along the edge. Lifeguard kayaks are great for carrying an exhausted swimmer, also because the rear of the kayak has increased volume so that the swimmer's weight does not make the front of the kayak come up out of the water. Go to Kayak Design & Kayak Construction.